If you found yourself shrugging when it was announced that celebrity chef Jonathan Waxman was opening a restaurant in town, don't fret. You weren't alone. Waxman was a pioneer of California cuisine, with contemporaries such as Alice Waters and Jeremiah Towers. Pulitzer Prize-winning food critic Jonathan Gold once called him "the Eric Clapton of chefs." Waxman became a more current household name thanks to a recent stint on Bravo's "Top Chef Masters." He has restaurants in New York, Nashville, and now, since opening Brezza Cucina in October 2015, Atlanta. In short, he is kind of a big deal. But these days it takes more than the name of a famous out-of-town chef to woo and captivate Atlantans. Atlanta is proud of its homegrown talent — chefs like Adam Evans, whom Waxman enlisted to sail his Atlanta ship. Evans was the soul of the cooking that put the Optimist on the map. He paid his dues working there and at Ford Fry's flagship JCT. Kitchen and Tom Collichio's short-lived Craftbar before that. In recent years, Evans has enjoyed substantial creative freedom and his cooking seemed to thrive in such environments. But at Brezza, the talented chef appears to have been benched. The restaurant bills itself as a modern Italian American restaurant. Since opening in Ponce City Market last fall it has been packed with Beltline enthusiasts and market shoppers. The dining room — about the size and shape of an Olympic swimming pool — is sparsely decorated. The vibe is industrial chic with painted white bricks, high factory ceilings, and large windows that allow an abundance of natural light to stream in during the day. At night, the room is warmly lit with string lights and the fiery glow of a wood-burning oven. The menu is separated into the classic categories antipasti, secondi, and contorni, and dolci. Waxman's initials are everywhere on the menu. You don't see much of Evans at all, which is a shame. The JW kale salad, which is made with silky chopped kale tossed in a pungent anchovy dressing and topped with a delightful smattering of breadcrumbs, was one of the most enjoyable dishes I tried. A simple starter of plump grilled oysters was brightened with tangy balsamic butter and a simple squeeze of lemon. Cubes of crispy pork belly were the stars of a plate that embodied springtime — the juicy hunks of pork counterbalanced with radishes and peas atop a spring pea puree. Most of the pastas I tried were overcooked. Strands of thick bucatini — chewy and swollen with too much water — tossed with Sapelo Island clams and guanciale were awkward to eat in the tall bowl they were served in. The gnocchi, which is served in a cast iron pan finished in the oven, tasted salty and burned. Fresh raviolis filled with smooth ricotta were the one bright spot. The delicate pockets finished with ramps, morels, and a buttery sauce were a treat. Despite being prepared in an elaborate wood-burning oven, Brezza's pizzas were also a disappointment. At the high temperatures such ovens are capable of reaching, the pizza's dough should have exploded into a puffy, airy crust. Instead, it resembled a dense focaccia. The basic tomato and mozzarella pizza tasted like it was made with quality ingredients, but the lackluster texture was so disheartening much of the pizza went untouched. Another pie made with mozzarella, crispy prosciutto, tomato, and arugula came with a pepper jelly that was so cloyingly sweet the pizza was almost inedible. Brezza's JW roast chicken, however, is a solid entrée choice. 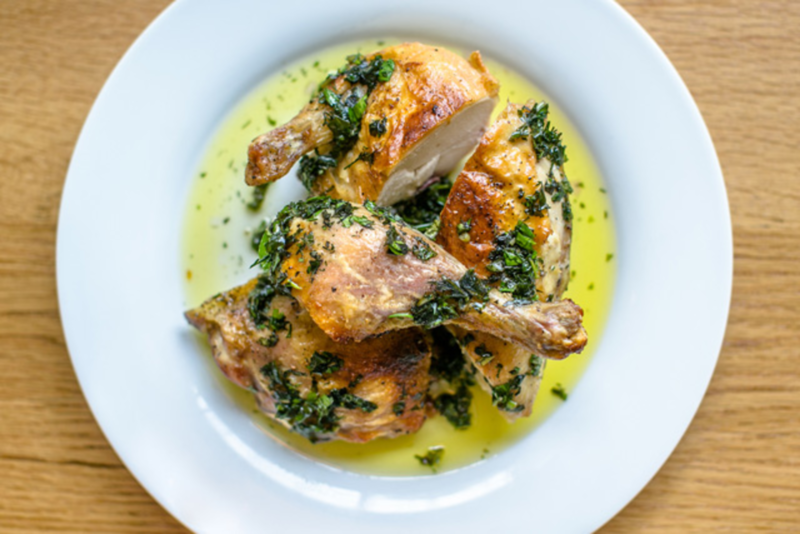 Half a bone-in chicken is cooked in the wood oven and then finished with a bright Italian salsa verde made with anchovies, parsley, garlic, olive oil, capers, and vinegar. Try it with a side of the addictive fried potatoes covered in grated Parmesan. The meal ended sweetly. A bittersweet chocolate budino topped with whipped cream was rich and thick. The accompanying biscotti provided a nice crunch to the creamy pudding. A lighter option, the chocolate and sea salt sorbet, had a smooth, pleasing texture and just enough chocolate flavor to make it feel indulgent. The two cocktails I chose from Brezza's list of five rather uninteresting options were unbalanced and poorly executed. The JW Paloma — El Jimador tequila, grapefruit, and soda — was heavy on the tequila. The shrub cocktail was an odd-tasting mix of vodka, balsamic preserved citrus, ginger, and red wine. For the most part, Brezza accomplishes what it set out to accomplish. It’s a trendy, attractive restaurant with mass-market appeal. But it lacks creativity, personality, and soul. There were moments when I felt like I was in a turn-and-burn resort restaurant.